Wherever there is a channel for water, there is a road for the canoe. 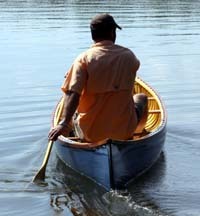 There is nothing quite like paddling a wood/canvas canoe. The ribs, gunwales, thwarts and decks define the shape of the boat while the longitudinal planking supports the waterproof skin of filled canvas. The hull is free to flex and move as needed to suit the situation. No glue is used – bronze nails, bolts, and screws fasten the framework together while brass tacks clinch the planking to the ribs. The hull is a dynamic shape under tension and far more resilient than most people realize. A canoe constructed using this traditional method will retain its shape even when heavily loaded and tested against a swift river. It will flex and give allowing it to bounce off rocks or logs. If the boat does sustain damage it can be repaired – every piece that goes into building one of these canoes can be replaced. The designs and methods used in these classic canoes were adapted directly from the birch bark canoes built by native Americans. Although some of the materials have changed over the years the basics remain much the same as they were back in the late 1800’s to early 1900’s. We only use the finest materials in building our canoes. Northern white cedar is used for the ribs and planking due to its natural resistance to decay, ease of bending, and light weight. Western red cedar can be used for contrasting planking if desired. Spruce rails and ash for thwarts and seats are standard. The canvas is mid-west cotton duck treated to resist mildew and rot. It gets filled with oil/silica based filler which, once fully cured, yields an extremely durable skin. Marine spar varnish finishes out the interior and trim while marine enamel paint protects the exterior. 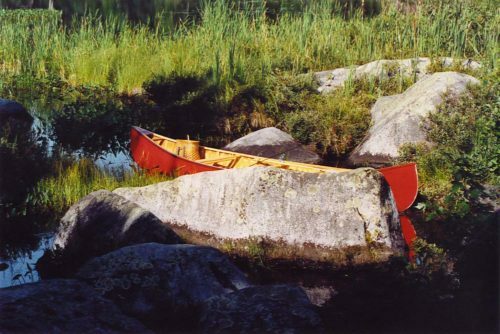 There are many options that can make your canoe truly unique – mahogany gunwales, cherry or walnut trim, custom hand-caned seats, etc. 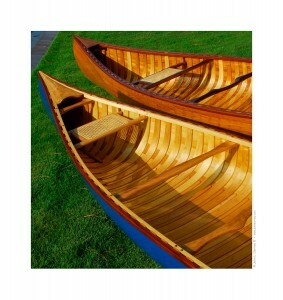 Please feel free to contact us if you would like to discuss commissioning your own wood canvas canoe. If you already own one and it needs some help, visit the restoration page for more information.